FAMPAC is NCAFP’s voluntary political action committee (PAC) that provides North Carolina family physicians with an opportunity to have a strong voice in the N.C. General Assembly. Why support your PAC? FAMPAC contributions go directly to support legislators whose business, legal, and medical philosophy are consistent with those of the NCAFP and family medicine. As a result, our specialty’s interests are more likely to receive greater attention among the many competing interests and proposals put forth for consideration. Voluntary contributions to FAMPAC are not limited to the suggested amounts and should be written on a PERSONAL CHECK. Funds from corporations cannot be used for contributions and expenditures in either federal or state elections. If you are a Professional Association (PA) physician and send your contribution on a PA check, such funds must be from a non-refundable drawing account established to permit draws against salary or profits and represent personal funds rather than funds of your PA. The NCAFP will not favor or disadvantage anyone based upon the amounts of, or failure to, make PAC contributions. Copies of FAMPAC reports are filed with the Federal Election Commission and are available for purchase from the Federal Election Commission in Washington, D.C. Voluntary political contributions are subject to the limitations of FEC regulations, Section 110.1, 110.2 and 110.5 (Federal regulations require this notice). Contributions to FAMPAC are not deductible as charitable contributions for Federal Income Tax Purposes. N.C. LAW REQUIRES POLITICAL COMMITTEES TO REPORT THE NAME, MAILING ADDRESS, JOB TITLE OR PROFESSION AND NAME OF EMPLOYER OR EMPLOYER’S SPECIFIC FIELD FOR EACH INDIVIDUAL WHOSE CONTRIBUTIONS AGGREGATE IS IN EXCESS OF $50 IN AN ELECTION CYCLE. as expert witnesses for the prosecution. In separate legislation (House Bill 703), the threshold for publishing medical malpractice settlements on the Medical Board’s website was increased from $25,000 to $75,000. The State Budget - Facing the largest financial shortfall in years, the state’s Medicaid program faced tremendous cuts, with provider rate cuts proposed in the double digit percentages. On September 29th, the N.C. Division of Medical Assistance released a new Medicaid provider rate structure with changes to be implemented October 1, as a result of the budget cuts implemented during this year’s Legislative session. Most rates are being reduced 9% to an average of 86.5% of Medicare. However, the Legislature had provided the Secretary of the Department of Health and Humans Services the ability to protect access to primary care. As a result, primary care E&M codes will remain unchanged from the current rate of 95% of Medicare. Codes protected include new patient office visits, established patient visits, hospital visit codes, nursing home visit codes, new patient comprehensive preventive medicine, smoking cessation, and brief intervention for alcohol and substance abuse. Thanks to the Academy’s Government Affairs Consultants - Peyton and Joel Maynard - for their superb efforts this year to work with others from the House of Medicine to minimize the negative impact of the state’s current economic condition. CME: A Cornerstone of Your Academy We don’t always write about it -- other than to promote a meeting -- but the fact is continuing medical education (CME) is central to what your Chapter does each year. In fact, it’s a cornerstone of the Academy. The NCAFP Membership Department would like to thank all members for maintaining their commitment to their professional community and to family medicine. We value your membership, participation, and interest in the AAFP/NCAFP, and we’re always here to answer any questions you may have. Many members have asked a series of common questions throughout the year, and hopefully the Q&A below will serve as a helpful resource. Q: Once I become a member, when and how do I pay my dues? A: The AAFP will mail an invoice to your preferred address in October for the upcoming year. To make a payment, you may call the AAFP at 1-800-2742237; pay online at www. aafp.org/myacademy; or mail payment to: American Academy of Family Physicians, 11400 Tomahawk Creek Pkwy., Leawood, KS 66211-2680. CMC Residents: The AAFP will mail an invoice to your preferred address. Please give your invoice to your Residency Coordinator so your Residency program may pay your dues. Your billing cycle is July – June. Q: How do I view or update my CME record or determine my re-election cycle? A: You may do that anytime at the AAFP’s website at www.aafp.org/myacademy. Click on the CME Center tab, then click on CME Records (Members Only). There, you will be able to view your re-election cycle; view your transcript; report CME; print a reporting form; and find upcoming CME like announcements for NCAFP meetings and workshops (always a great way to earn credits!). Keep in mind that if you were last re-elected in 2006, you have until the end of 2009 to report 150 hours of CME in order to maintain your Academy membership. Hours reported should be obtained between January 1, 2007 through December 31, 2009. To report CME, call the AAFP at 800-274-8043; Fax to 913-906-6269; or report online as instructed above. Q: How do I view or update my contact information? A: Making sure we have your current phone and fax numbers, e-mail address and work/home addresses are extremely important, especially when information needs to get to you in a timely manner. You may always send contact information directly to Tara Hinkle, NCAFP Membership Coordinator, at thinkle@ncafp. com, or you may change it online at www.aafp. org/myacademy. comments on individual stories, share content with external colleagues and access information easier. The Chapter will introduce the new site in the coming weeks. Visit www.ncafp.com today. After years of advocacy work by leaders at East Carolina University and the NCAFP, the reality of a new family medicine center at ECU can be seen firsthand. Recently, active construction activities for the Center have begun, the most visible of which include site preparation and foundation work. If all goes according to schedule in Greenville, it is anticipated that the building will be operational late next year. The Academy will be monitoring construction progress of the Center and will be posting photos as they become available at http://www. ncafp.com/home/gallery/ ecu_fmc. A few aerial shots showing the completed site work appear at left. Stay tuned for more. NC Family Medicine Leaders Sharpen Their Media Skills at Annual Leadership Retreat The NCAFP held its annual leadership retreat in Raleigh in late July. Family physician leaders participated in a full day of media training led by Roger Friedensen of the Catevo Group, a Triangle-based advertising and communications agency. Two media professionals were on-hand to offer pointers and insights. NBC 17’s Julie Henry, and Van Denton, a reporter formerly with the Raleigh News & Observer, both spoke about key aspects of reporting and media coverage during a panel discussion. Taped mock interviews were also conducted, then analyzed and discussed. The day concluded with a meeting of the NCAFP Board of Directors. AAFP LIVE is coming to Greensboro, NC, on Saturday, Oct. 24th for a full day of free education. Two 4-hour sessions will be presented to attendees: one segment on Pain Management and one segment on Sleep Disorders. Attendance is free, but each session requires separate registration. For complete information on this conference and to register, visit http:// www.aafp.org/online/en/home/cme/aafpcourses/ conferences/aafplive/greensboro.html. NCAFP and supported by an educational grant from the Gebauer Company will be presented in the coming months. If you need an update to the joint injections and skin biopsies workshop, you will be able to participate in our online CME workshop via the web in the near future. Sponsored by the NCAFP and the TCL Institute, LLC, and supported by an educational grant from Takeda Pharmaceuticals North America, Inc, this project will include various CME opportunities available via teleconferences, online self-study, live meetings, e-cases, chart review assessments, and patient surveys. The program is expected to be available later this year and throughout 2010. If you are interested in any of these, please contact the Marietta Ellis, mellis@ncafp.com, telephone 919-833-2110, ext 109. 2010 Spring Family Physicians Weekend March 25 – 28th, in Williamsburg, VA.
Join us in historic Williamsburg, VA, for an educational and fun-filled weekend for the whole family. Dr. Sara O. Beyer has begun planning another great educational program. Some of the tentative topics include: Controlling Hypertension in the African American Patient, Safer Opioid Prescribing/Pain Management, Vitamin D, Diabetes Update, Patient Centered Medical Home, American Recovery and Reinvestment Act (Economic Stimulus) and many more topics. Look for a postcard in your mailboxes later this year. The ICARE Partnership began its work in July, 2006 and this upcoming December will mark the end to the inital phase of the project. The core partners since its inception have been the NCAFP, the NC Psychiatric Association (NCPA), NC Pediatric Society (NCPS), Southern Regional Area Health Education Center (SR-AHEC) and the Foundation for Advanced Health Programs. In addition to these partners, the Partnership has been fortunate to have an Advisory Board membership that reflects broad support for the project from governmental agencies, primary care providers, psychiatric professionals, postgraduate, professional and consumer advocacy organizations (see the ICARE website for a list of Board members www.icarenc.org). Since 2006, with the support of the NC Office of Rural Health and Community Care and through funding from Astra Zeneca, the Duke Endowment, the Kate B. Reynolds Charitable Trust, and the NC Department of Health and Human Services, ICARE has strived to be a Center of Excellence for Integrated Care. This has been demonstrated through the following accomplishments: •	Development and maintenance of a very successful website (www.icarenc.org). •	Implementing many model programs. •	Training over 7000 providers: held over 140 trainings for primary care providers and behavioral health specialists and delivered technical assistance to approximately 65 practices since 2006. ICARE’s phase I and II pilots involved 20 practices that have served over 6700 patients. •	Becoming a central statewide clearinghouse for innovations in integrated care. •	Establishing a national reputation for being a pioneer in integrated care. •	and, identifying key policy and process issues which must be addressed for Governor Perdue’s objectives for integrated care to be realized in North Carolina. program available from the NCAFP website at http://www.ncafp.com/healthcaredisparities. This free online module is presented by Dr. John Smith and is approved for 3 AAFP prescribed credits. The program is also approved by the NC Nurses Association for 1.5 nursing credits. If you would like more information about the NCAFP’s Health Disparities Initiative, please visit the website at www.ncafp.com/home/programs/ disparity. Overview of Loan Repayment Programs Family medicine residents and new physicians have a number of programs they can access regarding medical student loan repayment. Below is an overview of several key programs that can be investigated by new family physicians. Each of these programs list specifics and application forms on their respective web pages. NC Medical Society Foundation’s Community Practitioner Program - The Community Practitioner Program provides financial assistance to family physicians (and other types of providers) in return for service in an underserved community. The Community Practitioner Program serves 153 rural, economically distressed and medically underserved communities in 87 counties. Eligibility requirements include practicing in a documented health manpower shortage area, medically underserved area or economically distressed area. The program has supported 370 health professionals in the state since 1989. To date, the program has provided $5.1M in loan repayment to Family Physicians. Visit http:// www.ncmsfoundation. org/pages/comm_pract_ prog/our_successes.html for complete information and an application. NC Office of Research, Demonstrations and Rural Health Development - The shortage of primary health care providers in North Carolina is severe, particularly in the state’s rural areas. In response to this shortage, the state has pioneered innovative approaches using incentives for placing health professionals in its underserved communities. Incentives include medical loan repayment (principal plus interest) and facilitation of the application process for the Federal Loan Repayment Program (National Health Service Corps.) Please visit http://www.ncruralhealth. org/services.html for complete information. National Health Service Corps - The National Health Service Corps Loan Repayment Program provides $50,000 (or the outstanding balance of qualifying student loans if it is less than $50,000), tax free, to primary care medical, dental and mental health clinicians in exchange for two years of service at an approved site in a Health Professional Shortage Area. Upon completion of the service commitment, clinicians may be eligible to apply for additional support for extended service. Information on this program is available at http://nhsc.hrsa.gov/ loanrepayment or via the NC Office of Research, Demonstrations and Rural Health Development at http://www.ncruralhealth. org/services.html. Public Service Loan Forgiveness Program This is a brand new federal program established in late 2008 for federal student loan borrowers who work in certain kinds of jobs and in certain settings. It will forgive remaining federal student loan debt after 10 years of eligible employment and qualifying loan payments. Please refer to http://www.ibrinfo. org/what.vp.html#pslf for complete information on this new program. Each of these programs are outlined on the NCAFP website, with links to the specific web pages. 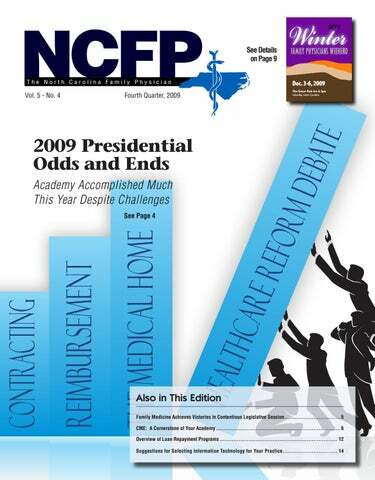 Residents and new Family Physicians are encouraged to visit http://www.ncafp.com/ residents_and_students/scholarships. NC Active at National Conference of Family Medicine Residents & Students August’s National Conference in Kansas City was a busy one for North Carolina. All public and university-based residency programs were represented and the Chapter’s Resident and Student Delegates, Dr. Meshia Todd and Lillianne Lewis, were active in their respective Congresses. The Chapter co-hosted an event that showcased the state’s residency programs. In the Resident Congress, a resolution that was co-authored by NC’s Megan Adamson, MD, titled ‘Increasing U.S. Medical School Graduates Entering Family Medicine Residencies’ was officially adopted. In the Student Congress, a resolution by NCAFP’s Lillianne Lewis led the Congress to re-affirm AAFP’s current policy on its ‘Health Care for All’ position. Finally, the ECU Family Medicine Interest Group was recognized with a Programof-Excellence Award and received Special Consideration in the FMIG Categorical Awards for it retention of M3 and M4 Members. Wake Forest Family Medicine Interest Group Highlighted by AAFP’s E-Student Update The AAFP showcased the work of Wake Forest University’s Family Medicine Interest Group in its summer e-newsletter targeted at medical students. Wake’s current FMIG President, Ms. Lexi Nifong, (M2) was quoted throughout the article as she outlined the club’s activities last year. It is expected that the group will present an equally impressive array of activities for this academic year as well. Kudos to Wake FMIG! New Resource Available to Educate Medical Students on the Medical Home The AAFP announced the availability of a new educational resource aimed at helping to educate medical students on the Patient-Centered Medical Home model of care. The resource highlights Community Care of North Carolina (CCNC) and other PCMH efforts. The resource is a product of a collaborative project between the Academy’s Division of Medical Education and the Society of Teachers of Family Medicine (STFM) and is entirely web-based. Visit http://fmignet. aafp.org for more information and to download. essential. Seek external expertise when you need it. If you ask a member of your administrative staff to take on additional responsibilities related to IT, temporarily delegate some of his/her functions to another employee so there’s time to do the job right. Remember that IT is a tool, not a solution. People, not computers, will make the experience of selecting new technology a positive or a negative one for your practice. Good luck! Margie Satinsky, MBA, is President of Satinsky Consulting, LLC in Durham, NC. She can be reached at Margie@satinskyconsulting.com or (919) 383-5998). How to Get Paid for Administering H1N1 Vaccine When it Arrives NC DHHS released information in September regarding Medicaid payment for practices participating in H1H1 vaccine administration efforts. NC DHHS plans to reimburse for the H1N1 administration in accordance with the current immunization administration rates for other vaccines. For Medicare, CMS wants physicians to bill for the vaccine using the new ‘HCPCS G9141’ code; payment will be the same as for administration of the seasonal flu. Other major carriers like Cigna, Aetna, United and others are requesting physicians utilize existing CPT codes for the administration, with specific codes for the vaccine itself. It is important to indicate the amount of $.01, as some payment clearinghouses will reject no-charge items. For BCBS, physicians and practices are being directed to contact their local plan representative. As more payment information on H1N1 payment is available, the NCAFP will make this information available. NC Medical Board Set to Expand Licensee Information Pages The NC Medical Board is expanding the licensee information pages published on its website to include new, optional information that each physician can update. Notices on this expansion were sent in September and implementation is expected in December, 2009. Expanded information on each licensee will include practice web addresses, lists of professional memberships, scholarly works and achievements, honors and awards, more information on residency training and Board certification(s), and expanded information on how each physician practices (EHR utilization, insurances, office hours, focus areas). Physicians will also be able to comment on prejudicial information where appropriate. See www.ncmedboard.org for more information. In mid-July, the federal health information technology (HIT) Standards Committee approved a set of quality measures and standards that providers could use to demonstrate ‘meaningful use’ of electronic health records (EHRs). The panel endorsed a matrix of 27 quality measures and 12 standards that build on each other. Physicians and practices who demonstrate meaningful EHR use will qualify for Medicaid and Medicare incentive payments as part of the federal economic stimulus package. The standards call for providers to use HIT tools for continuity-of-care documents, discharge summaries; inpatient and outpatient prescriptions; laboratory results and other structured health data. A good analysis and discussion of this development by Chapel Hill’s Dr. David Kibbe can be found online at http://www.thehealthcareblog.com/the_health_care_blog/2009/08/finally-areasonable-plan-for-certification-of-ehr-technologies.html. Family physicians and practice professionals that participate in NC’s Universal Childhood Vaccine Distribution Program (UCVDP) are advised that all dorm-style refrigerators commonly used for permanent storage of vaccines are to be phased-out of provider offices by Dec. 31, 2009. A dormstyle refrigerator is considered a unit with one door and one that utilizes a combination refrigerator/ freezer. The new UCVDP requirements can be found in the ‘Vaccine Storage Equipment’ section of the UCVDP Minimum Required Vaccine Ordering, Handling, and Storage Procedures’ (updated January, 2009). The new requirements are designed to ensure that vaccines are properly stored and managed. Practices that have questions about the new guidelines are being directed to contact the UCVDP Help Desk at (877) 873-6247. As of dates of service beginning 11/01/09, certain radiologic procedures for Medicaid patients will require prior authorization from Med Solutions. Med Solutions will begin to accept requests for prior authorization on 10/19/09 via their website, phone, or by fax. Physicians and practices are being encouraged to familiarize themselves with MedSolutions by visiting the MedSolutions website at http://www.medsolutionsonline.com/. Among the many online tools and services available, providers may also register for prior authorization services and view MedSolutions’ imaging guidelines. The AAFP is offering members discounted access to a new tool designed to help them earn extra dollars through CMS’s 2009 Physician Quality Reporting Initiatives (PQRI). The ‘PQRI Wizard’ enables participating physicians to track individual patients and correctly report all necessary quality data to CMS. PQRI bonus payments generally range between $600 - $2,000 and depend on each physician’s Medicare population. A good rule of thumb for physicians seeking to estimate their potential PQRI bonus is to multiply their 2008 Medicare revenue by 2%. The new tool also helps physicians who are starting late with PQRI to catch-up by working back through a limited number of charts. The cost to AAFP members is $199. Visit https://aafp.pqriwizard.com/default.aspx for more information and to sign up. current and future developments of the contract process, and that were free of conflicts-of-interest in this process. Utilizing the advice of our Academy leadership, recommendations from the N.C. Medical Society and other entities, I would like to announce that we have developed an initial relationship with the Raleigh firm of Smith Anderson, et. al., to help assist members in this area. The leaders of that firm clearly have expressed an understanding of the goals of Family Physicians in contracting and will actually present a workshop on this subject at this year’s Annual Meeting in Asheville. Please look for these and other developments from this association in the future. In closing this final article as your president, I wish to thank you, the membership, for your support in the process. It has been a year of challenges for the Academy and as we have worked to tackle these challenges, it has amazed me how quickly this Presidential year has gone by. I look forward to the leadership that will be provided by our rising leadership team and I hope to encourage our younger members to step forward and become involved in this process as well. Last, I wish to ask for your support for our PAC and Foundation with your contribution dollars as the challenges which are to come may prove to be greater than anything that we have faced in our previous sixty years of existence. Thank you. Family Medicine, continued from p5 Unfortunately, medical students have been led to believe that they cannot manage this if they become Family Physicians. Although it can be a struggle financially for some primary care physicians, it is important that we develop a family medicine culture which shows medical students that they can in fact thrive financially and they can expect to be valued by their patients, community, and the medical profession as an esteemed health care provider that is at the heart of quality medicine. However, we also have to be active to shape policy that makes our profession the “cream of the crop.” As policymakers, we have to ensure that we make Family Physician payment adequate, the lifestyle appealing and the bureaucracy minimal for those entering our profession. With medical school expansion on the horizon and the possibility of many new residency positions, we need to insist that extra slots be reserved for primary care, especially family medicine. If more medical students graduate and pursue careers in Cardiothoracic Surgery, we will not have helped our workforce shortage and the answer to the question: “Who is your Doctor?” will remain an elusive one for many patients. The NC Academy of Family Physicians is strongly advocating financial incentives for medical schools that have students who stay in primary care and that any increase in residency positions needs to maintain a significant balance of primary care positions. With any health care reform, resources have to be targeted to the right area to get results. Family medicine has to be at the center of that bull’s eye.